Culture is not always conscious. It is not just what is seen or heard. Through thousands of exceptional and unexceptional daily actions, the First Nations of Australia constantly perpetuate — continuing stories that stretch infinitely through time. 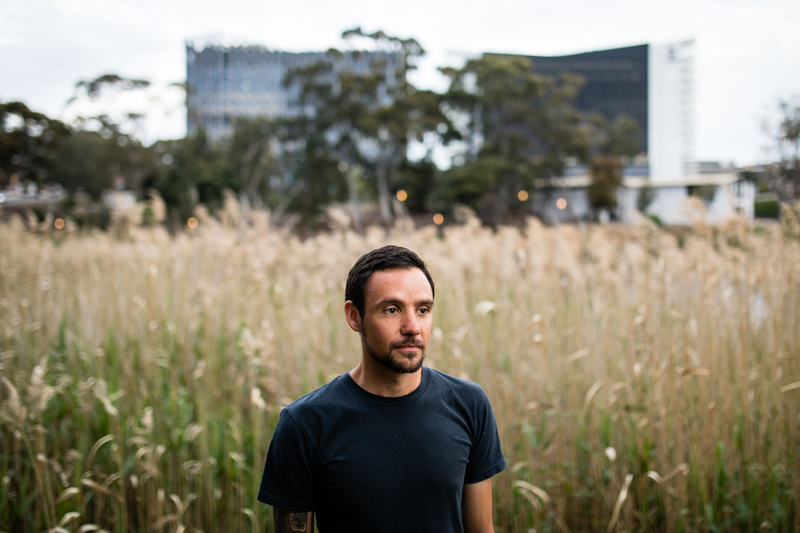 James Tylor walks along the banks of Karrawirra Parri, the river that runs through Adelaide’s CBD. It’s early in the morning, still cold. Without a break in tone, he switches from discussing the weather to recounting an episode in the violent history of the land under his feet. This was one of Australia’s early missions – where Aboriginal people were forced to live under colonisation. Here, in a little quiet slice of the city, hundreds of Aboriginal people were taken from different First Nations, from different families, confined, and forcibly torn apart from the traditions, practices, languages, and stories that helped make them who they were. James is a Kaurna, Maori, and European man. He’s a visual artist who works mostly in photography, but who also makes objects that become part of his art. Today, he’s walking toward a riverside reed bed from which he has previously gathered material to make a spear, but he pauses to dig a hole and drops in a wodni (quandong) seed. 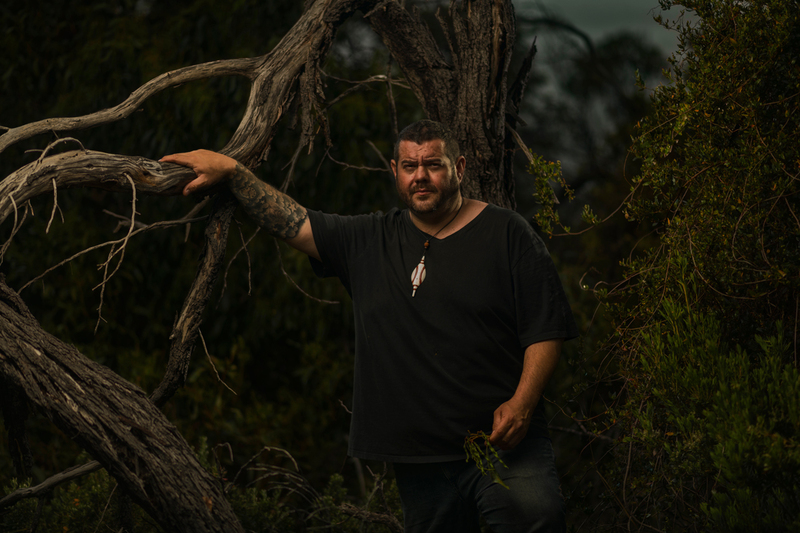 In James’ action, and in the ordinary, daily activities of thousands of Aboriginal South Australians, there is a quiet rejection of the architects of history who sought to interrupt the story of this land and its peoples. James and the others know that the story maintains – and not as a footnote to another narrative, not as something that creeps its way out through cracks in the pavement. Instead, it beats heavily in the heart of every person who practices it and learns it and shares it. It emanates forth from them and from the country, and embraces everything it encounters — change, resistance, inhumane histories, the unbearable present — infusing it all with the force of love, holding strong with the solid weight of identity. Few things have felt more quintessentially suburban than the Aldinga Beach backyard of Allan and Amy Sumner on a Saturday morning. Three generations of the family pass incessantly between the patio, the square of lawn, and the house – most of them in pursuit of Allan’s almost-two-year-old granddaughter Neakah. Every time someone crosses the threshold of the house Amy follows behind and, with a small sigh, closes the sliding door, hoping to keep the flies out. A BBQ — made from a half 44 gallon drum containing a fire that has almost burned down to coals – smoulders in the corner of the yard. “Whilst my wife cooks a lot of stuff in the kitchen, I’ve got the fire out the back,” says Allan. The tail will take a little less than an hour to cook over the coals, and in the meantime Allan and his eldest son Isaac — Neakah’s Dad — are pulled out from the gravity of the BBQ and toward the workbenches that sprawl across half the patio. 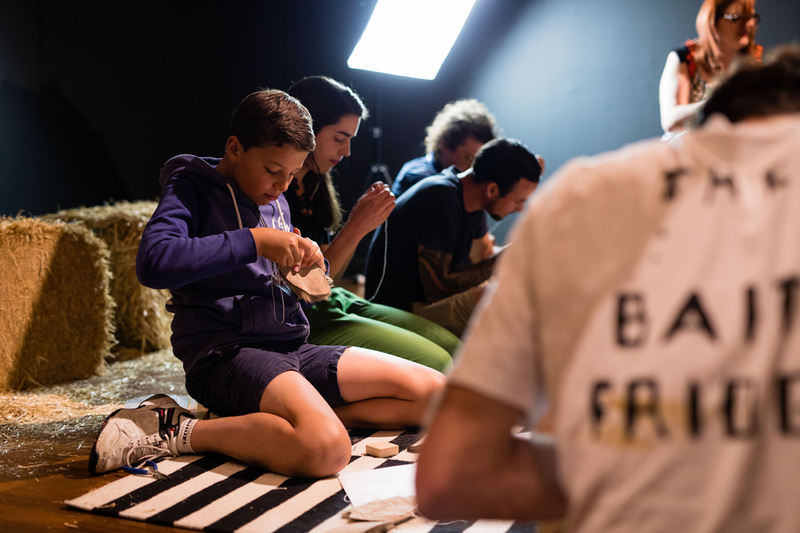 Here, Isaac has been working alongside Allan in his business Aboriginal Contemporary Arts, carving wood to be installed as cultural artefacts at playgrounds and other public sites. Wood carving and making objects like murlapaka (a Kaurna shield) is something Allan learned from his Father, but it’s only something Isaac — now 20 — has been interested in recently. “I didn’t want to push the kids into culture, I think culture is something you have to find for yourself,” Allan says. The busy backyard is on Kaurna land, and Allan has Kaurna, Ngarrindjeri, and Yankunytjatjara family ties. 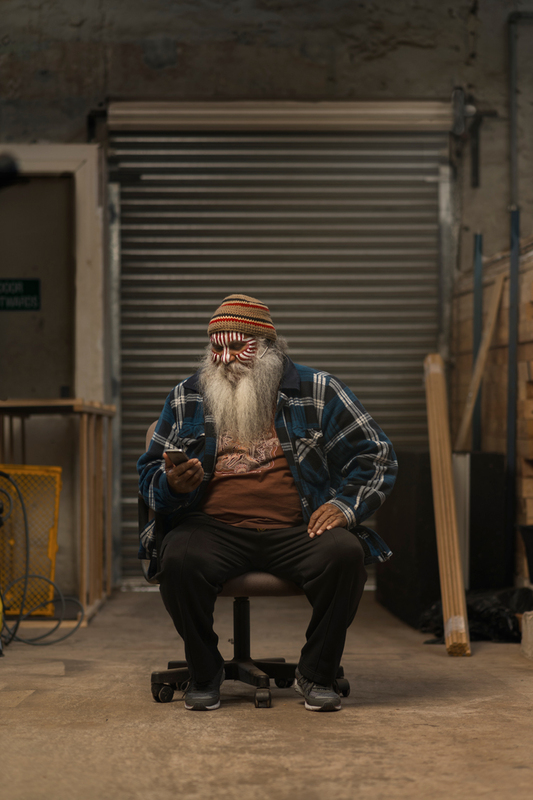 He and Isaac visit the nearby Aldinga scrub a few times a week — sometimes looking for the right wood for their carving, sometimes looking after the country, and sometimes on tours — sharing bits of culture with non-Aboriginal people. It’s just a walk in the bush a few hundred metres from the house, but on it the transfer of knowledge crackles between Allan and Isaac. And, back home, it’s just a Saturday lunch with the family. But as Allan pulls the roo tail out of the fire to share with his wife, his kids, his nieces and nephews, and his granddaughter, he knows that ordinary moments like these are part of a bigger reality he’s worked hard to create. “We’ll have cook ups, and just enjoy ourselves you know, with music, and do what every other normal family would do,” he says. Inawintji Williamson and Tjinkuma Wells don’t go to a backyard – they go to a classroom, or to a living room in the eastern suburbs. And when they get there, they teach. “We learn together,” says Inawintji. “Everyone needs their spirit from their culture to keep them strong,” says Tjinkuma. Tjinkuma Wells and Inawintji Williamson’s home is Ernabella in the Anangu Pitjantjatjara Yankunytjatjara lands. It’s about as far from Adelaide as you can get without crossing a border. Both women moved to the city for their health. Their need for thrice-weekly dialysis can only be satisfied in metropolitan surrounds (an indictment, surely, on the inherent privileging of the health system). But while Inawintji has been living metro for more than 10 years, and Tjinkuma has been doing the same for seven, the deep connection to their homeland will never fade. “When we come out from dialysis yesterday, I see the rain coming down that way, and the wind come blow the cloud away, and it made me sad, you know,” says Inawintji. But there are parts of home that the pair carry with them wherever they go, and chief among them is language. In the house they share, they speak Pitjantjatjara — “we never stop — we talk all day and night,” laughs Inawintji. And they teach the language to others — Tjinkuma volunteering with high school kids at Wiltja Secondary College, and Inawintji running weekly classes with non-Aboriginal women in a suburban lounge room. “It’s important for everyone to learn, to understand, the languages, songs — it’s really important,” says Tjinkuma. For both women, language is a bridge that brings the world of their home and the place they’ve been forced to adopt closer together — and it runs both ways. As well as teaching, Tjinkuma also translates. 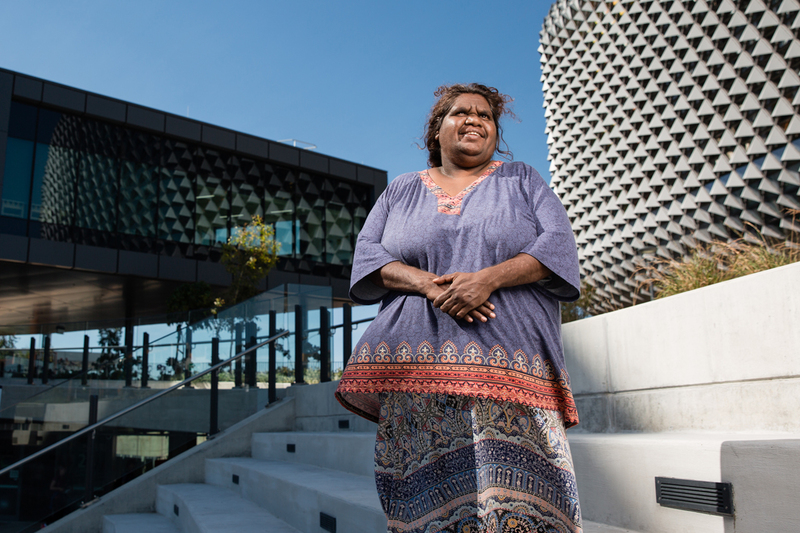 She did extensive work around the possible establishment of a nuclear waste dump in SA — feeding information back into the Pitjantjara community in their own language. Coronial inquests into suicide, court proceedings, and health consultations have also passed through her hands. And so has the Port Power Club Song, which – despite being Crows supporters — Tjinkuma and Inawintji can sing with ease in their first language. As can a whole bunch of footy supporters, since Tjinkuma translated it in collaboration with Paul Eckert in 2016. “I translated the song, and now everyone is calling me wanangara — this is lightning,” says Tjinkuma, with a laugh. There’s many songs Tjinkuma and Inawintji sing together and try to teach to those they’re with as we walk across a hill and watch the sun sinking below the city skyline. An old Pitjantjatjara song about kinara (the moon) draws a perfect, unrehearsed harmony from the two, and their rendition of the Port Power song brings on a bout of laughter. Singing together creates connection, and because of that it is both an ancient and an ongoing necessity. Whether the song is old or new makes no difference. “Some of the old methods have been lost due to colonisation,” says James, back at Karrawirra Parri, speaking about something else entirely. “So we need to make new methods”. 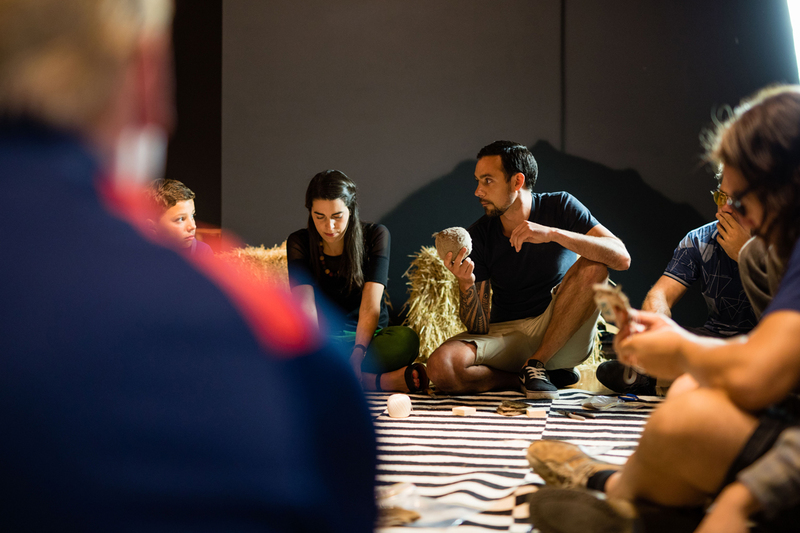 The artist fabricates parndos – traditional Aboriginal footballs – using his own process that he developed after looking through archival texts. 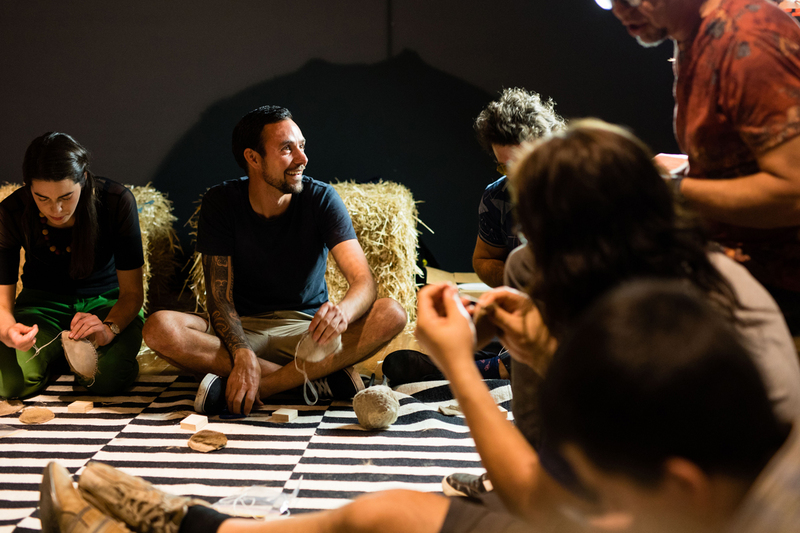 James Tylor is teaching a group of about 20 people how to make a parndo at the JamFactory in the Adelaide CBD. 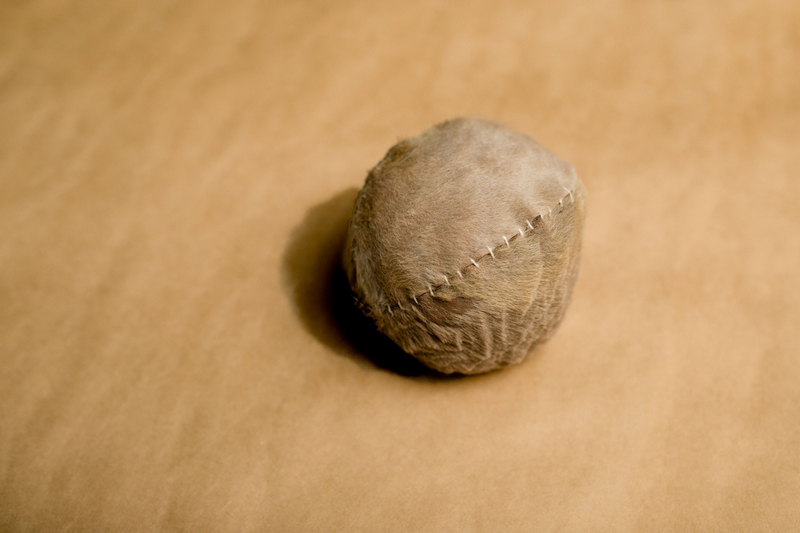 He is deftly demonstrating the blanket stitch required to bring together four sections of furry kangaroo skin to form the exterior of the ball, which is then stuffed with dry grass. He began making the balls after a friend had a bad experience in a university lecture; where other, non-Aboriginal classmates questioned whether AFL had actually taken any elements from the Indigenous marngrook game. 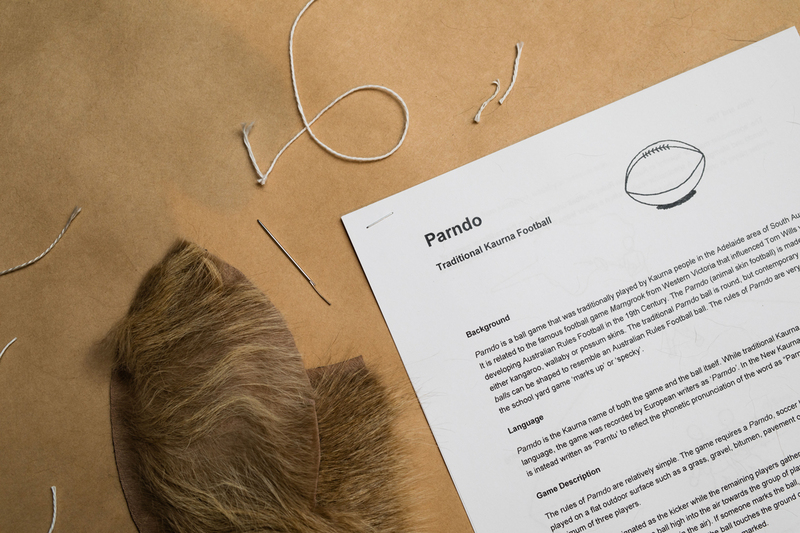 Stitching together the parndo, for James, is the same as signing off an email using Kaurna language. It’s a simple act that spreads knowledge and creates long-term change. “And then if you can continue to pass that on to the next generation they’re just going to go ‘yeah, of course it is. It’s obvious that it’s the case that the games are connected’,” says James. Making his first parndo, though, wasn’t easy. No-one James knew could make one, and he had to reverse engineer his method by examining descriptions or drawings of the balls in old texts. Using this kind of approach or through being taught by friends, family, and community, James has become proficient in a vast array of practices — from building traditional dwellings to making tools for hunting. Often, the results are included in his Un-Resettling series, which is a recurring part of his artistic output. 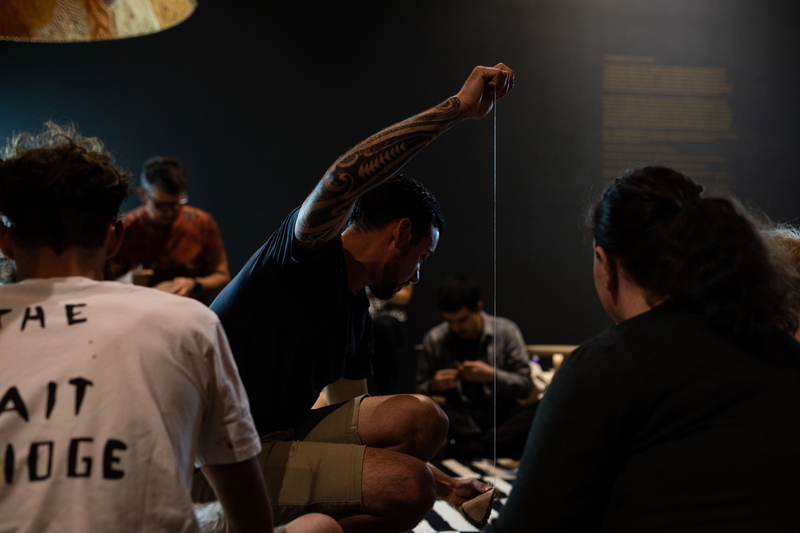 He crouches in front of a punter at the parndo workshop, sharing his new knowledge of how to make an object that has long been part of the world’s oldest living culture. “I look at it as just a continuation,” he says. “There’s obviously going to be changes, because… they deliberately stripped out the culture. “And the idea was to westernise Aboriginal people until they were bred out, til they were white, and then they’d just disappear into the population — that was what they were trying to achieve in Australia, but it didn’t work. James, like most people his age, has an Instagram account. On it, he shares his knowledge. His feed shows the results of a compulsive interest in bush foods, which he’s been fuelling through something he describes as “a massive must-eat-everything” experiment. “If you go out to pick wild foods and you don’t feel comfortable eating them, then that’s how badly damaged the environment is,” says James. 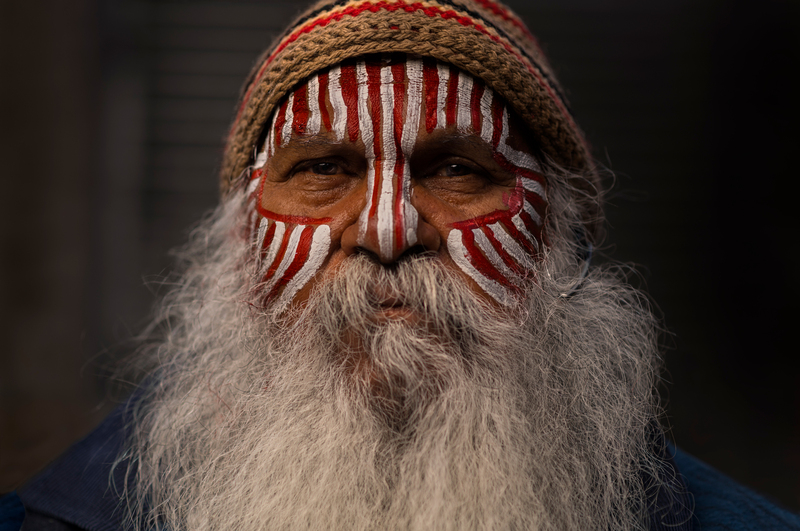 Ngarrindjeri Elder and Songman Uncle Moogy leads an annual journey along the Murray Darling. In March of 2017, he saw a small boy cross the river in a single step. Uncle Moogy, whose full title is Major Lancelot Sumner, AM, has lived in Findon for more than three decades, but he grew up in community at Raukkan — which means “meeting place” in Ngarrindjeri language. There, he was surrounded by the culture of his people. “I learnt all this at Raukkan — all the things about dancing, making the clubs, the shields, putting the markings on them,” says Moogy. “My uncle — he taught me… while we were working in the shearing sheds, on the weekends we were making. But passing it on in the city is different to teaching and learning at Raukkan. “Today people go to school, and with the school – they’re going to learn how to live in one world,” says Moogy. Each of Moogy’s days are filled with navigating between the two worlds – finding ways to help kids and adults of the Google generations understand knowledge as being greater and deeper than an amassment of facts. At the Tandanya National Aboriginal Cultural Institute, Moogy stands amid his Kaiki and Taralyi exhibition, surrounded by spears and spear throwers made under his guidance by young Ngarrindjeri men. Along the walls are also artistic responses to the relevance of natural materials — like grass tree resin or beeswax fixatives — from James Tylor and Damien Shen. “This is the teaching,” Moogy says — gesturing around the compelling, elegant exhibition, “this is handing that culture down”. Uncle Moogy hands culture down to other Ngarrindjeri people, but he also wants to entrust some knowledge of it to non-Aboriginal people. He has danced, demonstrated Ngarrindjeri fighting techniques, and performed smoking ceremonies all over the world. 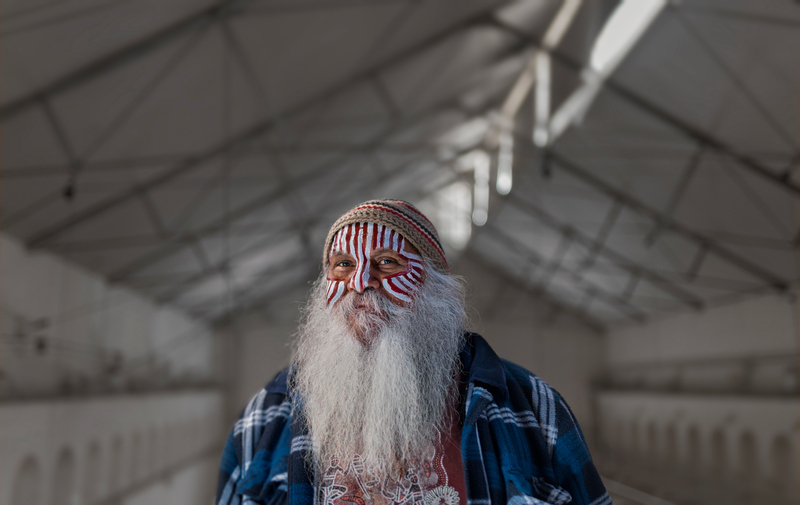 Moogy is delighted by a French society dedicated to boomerangs and spears, and actively encourages non-Aboriginal people to join Ringbalin – his annual dance and ceremony journey that follows the Murray Darling River. “We all should be involved in healing the land, and also healing the spirit that is inside of us,” he says. As an academic and artist, Ali Gumillya Baker simultaneously acknowledges what has been shared and creates new ways of sharing. In doing so, she builds a vision of the future that is different to the past. 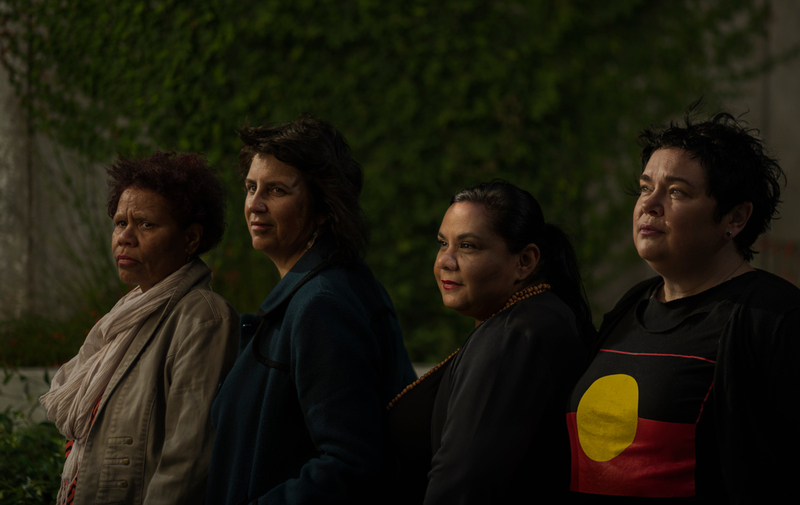 Ali Gumillya Baker, Faye Rosas Blanch, Natalie Harkin, and Simone Ulalka Tur are colleagues at Flinders University’s Office of Indigenous Strategy and Engagement. As artists, they are the Unbound Collective. They’re also friends. But their work together and way of being together is more than these things. 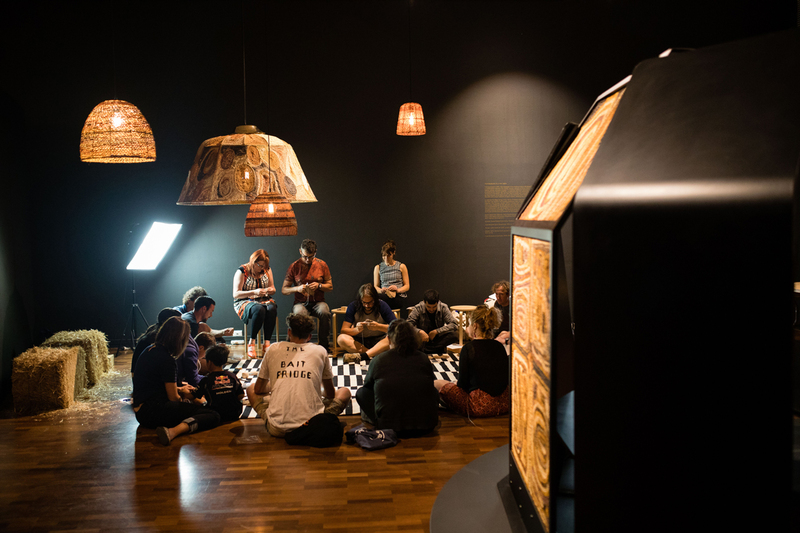 The four women — as artists and academics — think and create cooperatively and in doing so embody the practice of collectivity that sits deep within the social organisation of many Aboriginal First Nations. From this, Simone, Ali, Faye, and Natalie gather strength and resilience. “As individual academics we probably would have burnt out a long time ago in terms of the difficulty of the space we work in,” says Ali. “I’ve been teaching about social constructions of race for the last 20 years,” says Simone. “And so, depending on the political climate, the international climate — those conversations can be very complex, very emotional, sometimes very problematic. “But together we have resilience — Faye would always say that we are sovereign, and we are human. As artists, too, their collectivity has given the four women the ability to withstand and re-frame spaces and ideas that could otherwise be unbearable. In Bound and Unbound: Sovereign Acts II they created a multi-stage art project that was performed at institutions like the SA Museum. 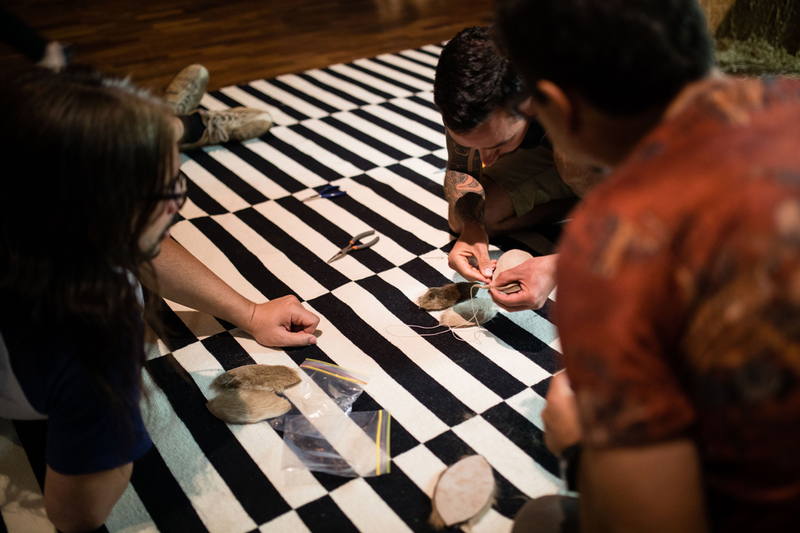 It directly sought to change a relationship previously defined by violence — actions including the collection, storage, and trade of Aboriginal people’s bodies after death. Love is an idea that might be studied and over-analysed in a university, but rarely is it considered part of the work done there. As academics, Ali and Simone believe it is central to their practice. Across the other side of the city, in another institution — the new Royal Adelaide Hospital (RAH) — Debbie Watson is working methodically amid the doctors and automated equipment. As she heals, she returns ideas of love and spirituality to the field of medicine. Debbie Watson is in Adelaide for just three days. Recently arrived from working in New South Wales, she is about to head out on the long drive to the APY lands. She lives in the lands, but she is not there often. As a ngangkari — a traditional Pitjantjatjara or Yankunytjatjara healer — she travels constantly to reach those in need. “I went to Perth, Melbourne, New South Wales, just doing healing work across the land — across this country,” says Debbie. Debbie’s grandfather passed the knowledge of healing to Debbie’s dad, who then taught her. She learned her techniques in the APY lands, but is now brought into hospitals and other clinical settings to work with patients who request treatment from a ngangkari, which is often delivered alongside other therapies. “Here [in the city], we do the same healing as we do in the lands,” says Debbie. “In the hospital it’s hard. People in the hospital are really sick. Debbie is a co-founder of the Anangu Ngangkari Tjutaku Aboriginal Corporation (ANTAC) — a body set-up to make this healing more readily and widely available. The organisation is in the process of establishing a national-first ngangkari clinic at Henley Beach. In this new forum, Debbie will continue to treat both people familiar with the ways of the ngangkari and those for whom it is entirely new. For her it doesn’t matter. Sceptic or true believer, in a hospital or in community, Aboriginal or non-Aboriginal – every person should be helped. From the courtyard of the RAH, to the banks of Karra Wirra Parri. In offices at Flinders University and in a gallery at Tandanya. High on a hill overlooking the city. Sitting around a table in a suburban backyard. From all of these places, and countless more, love, generosity, and spirit continue the cultural evolution, adaptation, and maintenance of the Kaurna, Ngarrindjeri, Yankunytjatjara, Pitjantjatjara, Mirning, Antikirnya, Mbararam, Yidinyji, and Narrunga nations. But in these places there are tensions too. The Unbound Collective can’t publish an academic paper under joint, equal authorship because convention won’t permit it. Allan and Isaac can’t collect some of the wood they need because the trees grow on private land (a concept that is, itself, little more than an obstructive, legally-legitimised, misunderstanding of our relationship to the world). There is no standardised pay system or entitlements for ngangkari working in the health system. Some of the plants James grows on public land will likely be ripped up by Council workers – considered to be weeds. Both Allan and Uncle Moogy say that dedicated spaces — cultural centres down south and in the CBD respectively — need to be built to help culture exist more readily in the everyday. James believes the use of more Kaurna language in the city centre could make that Nation’s culture more visible. Ali and Simone want the Western knowledge systems that govern institutions to cede their dominance, to respect another way of researching. These are calls for specific things, but they are also calls for a mutual response to love and generosity. They are calls for a country to be shared, not dominated. Calls for us to be together.